Project & Resource Management is foundational to running great projects. You need somebody to establish common ground and lead the team in the right direction. You need somebody to plan and schedule resources, and assign those resources to the right projects and tasks. Having your projects and resources aligned is exactly why having a proper project management and resource management practice in place is paramount to business performance, profitability, and a thriving work environment. These are both fields with long histories, lists of methodologies, and opinions on how to run a team best possible. No matter your preference of Agile or Waterfall, and subcategories of each, we thought Project Managers could need a little extra help. That's why we built Forecast. 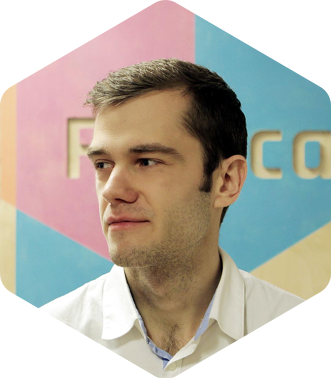 Forecast is an AI-powered Project & Resource Management platform built to make life easier for team members across an organization, thereby increasing business performance, and eventually directly influencing your bottom line. It's a collaborative environment with unique features assisted by AI. The system was built from the ground up to emphasize the benefits of implementing AI in your workflow, projects, and business. Forecast learns from experience across your organization to improve time estimations, labeling, etc. The Forecasted time estimates are used for scheduling and budgeting. It will thus give you a more accurate look at how your projects are performing, and if not well, show you where and help you get back on-track. Learning from your data and others, the algorithms are continuously improved to assist you even better from day-to-day. To give you a concrete example, when doing time estimates in Forecast, you specify a high and a low estimate, you assign one or more team members to the task, you write a description, and define other descriptors such as labels. Analyzing this data in an instant, Forecast is able to provide you with a more accurate estimate of the time needed to complete the task. The AI is using some of all of this data, combined with previous data inputs from other tasks and projects, to make a more reliable estimate. This estimate is then applied across the system to present a more realistic view on your budgets and available resources. The beauty of Forecast is really the simplicity, flexibility, and interconnectivity of the platform. Everything is linked together, simply because a change in your estimates naturally has a direct impact on your budgets, scope, timeline, and resources. 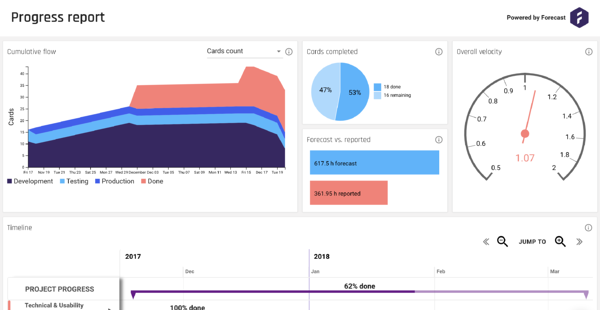 Through the implementation of an open API and a wide array of native one-click integrations, Forecast is not only leveraging intelligence from within, but also by connecting with other tools you may already be using. Ultimately, Forecast will function as your hub for the interconnected one-truth on your business insights, projects, and resources. The AI is present throughout Forecast. Below, we'll go through some examples. Looking for a Guide to Get Started with Forecast as an Admin? First entering Forecast, you'll initially get prompted to create your first project. Depending on your subscription plan, you can create as many projects as you'd like. Projects have a team assigned to them, they have Cards (i.e., tasks) in your Scoping (i.e., Statement of Work), and a budget. They may also have a rate card and a client assigned to them. The selected rate card is part of the calculations when generating your automated budget. 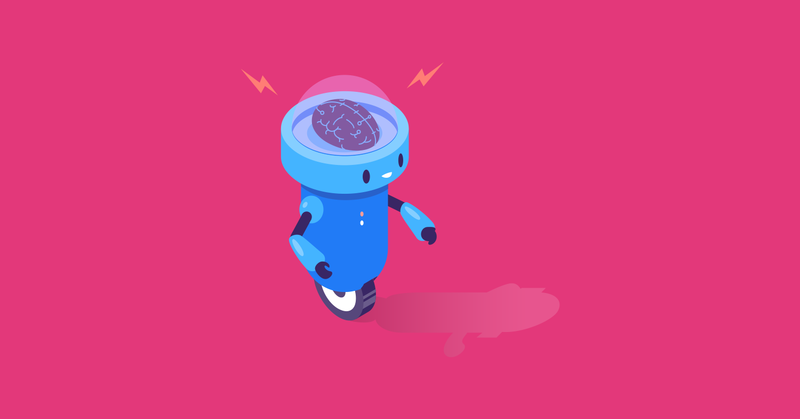 The first place you meet our AI is in the Scoping of your projects. Scoping is where you set up the Statement of Work, you create milestones, you add Cards (i.e., tasks) to the milestones, assign the Cards a main role, and give them a low and high estimate of the time you think it will take to complete. Now, meet Forecast AI. Using the information you've entered, the AI will now instantly show you a more accurate estimate based on previous experience. The Forecast, combined with the selected Rate Card for the project, will now also generate an estimated Price of completing the task. These estimates, as you see above, are the foundation of everything that happens later. As soon as you've finished your Scoping, you'll see a real-time budget generated for you in the Budget tab. This is the project's budget. In the case that you're working in Sprints, e.g. Agile with Scrum, you'll probably also want to set up your Sprints. Sprints are activated during the initial project creation or later in Project Settings. 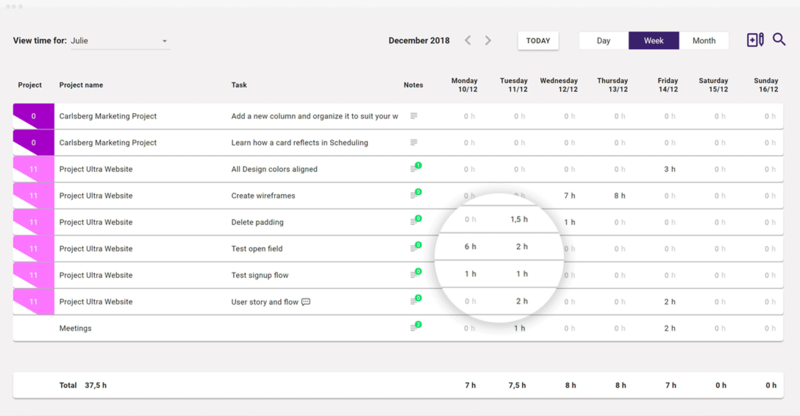 You get to Sprints by navigating to the new Sprints tab that will show up in your project. You're now ready to go to the Timeline tab. Timeline is based on the milestones and deadlines you set up previously during Scoping. As with most in Forecast, the Timeline is real-time and interactive. You can drag Milestones and Cards around, shorten or extend the time period, start- and end dates. The percentage shown, gives you a visual look at how each Milestone and Card are progressing. Taking a step back and moving out of your project, Scheduling is your next destination. Scheduling is where you plan the schedule across projects and teams. 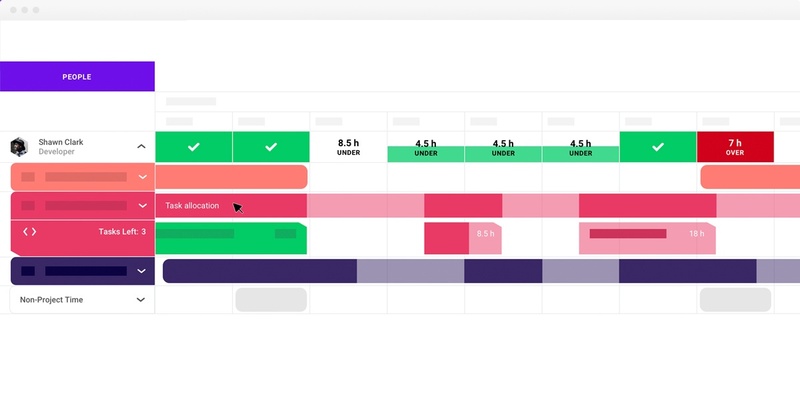 Similar to the Timeline, Scheduling is real-time and interactive. 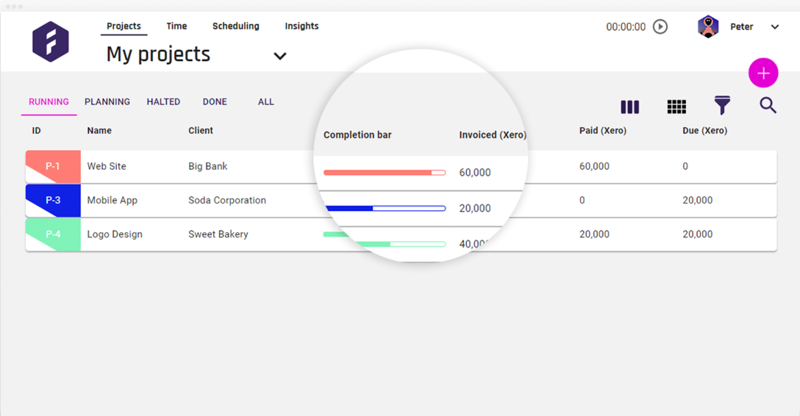 You can move allocations around, shorten or extend the timeframe, and book resources manually or through the Quick Book feature. Quick Book automatically helps you find available resources based on the role you need. You find the feature as a button in the People view or by hovering and clicking a Project in the Projects view. Scheduling ahead of time is easy with Forecast, but if you still want a more visual look into the future, using Virtual users as a blocker can be a great option. The example below shows a Virtual user named Senior Developer with the role of a Senior Developer. Using Filters in Scheduling, you can now select only to view people with the role of a Senior Developer. Using the Virtual user, you block the period you know you need a Senior Developer. This will now work as a visual representation of the resources you need, and you can easily allocate and assign work to the right people ahead of time. Now, if we take one more step back, we arrive at the Insights. Insights is where you create new Insights Reports. You can create as many as you want, you simply select the components you want, and you can easily drag them around to design the perfect report for each use-case. They're real-time, and they work across all of your projects, team members, etc. You just select the data source and you'll get the perspective instantly. Sharing Insights is made easy and secure with Forecast. Clicking the Share button inside each report, you can share the insights with any stakeholder you want without granting them access to anything else. You can send it by email or directly through a link. The link is password-protected, and thus only accessible with the password. This was a short introduction to some of the places AI is used in Forecast. Looking for a Guide to Get Started? We have tailored guides to each type of user, i.e., Admins, Managers and Controllers, Collaborators, and Clients. Additionally, we have a Guide on Planning with Forecast for Admins and Managers. Last, but not least, we have our Video Hub with Daily and Weekly Webinars, as well as Videos to help you get started. Live Chat is also available in the lower right-hand corner of the website or app, and you can Book a Demo Meeting with our Success Team.